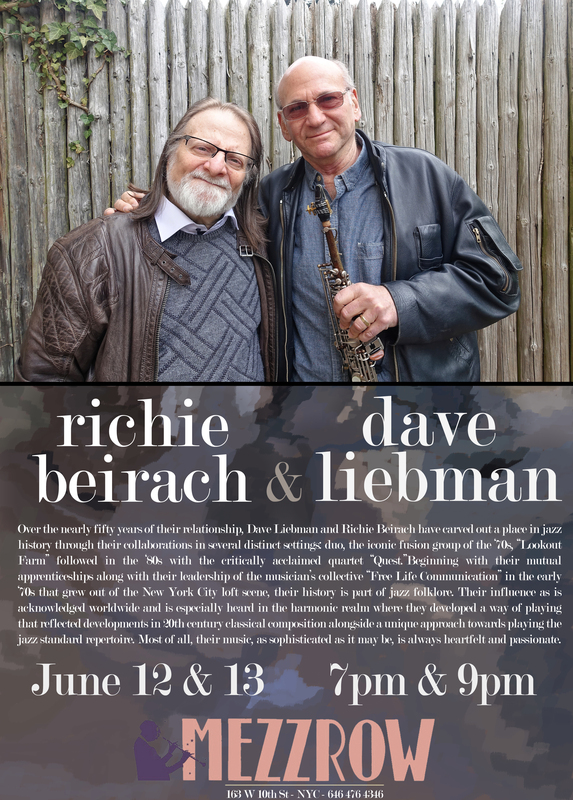 Over the nearly fifty years of their relationship, Dave Liebman and Richie Beirach have carved out a place in jazz history through their collaborations in several distinct settings: duo, the iconic fusion group of the ‘70s, “Lookout Farm” followed in the ‘80s with the critically acclaimed quartet “Quest.” Their musical telepathy is documented on several dozen recordings and years of performing together. Beginning with their mutual apprenticeships (most notably Lieb with Elvin Jones/ Miles Davis; Richie with Stan Getz/Chet Baker) along with their leadership of the musician’s collective “Free Life Communication” in the early ‘70s that grew out of the New York City loft scene, their history is part of jazz folklore. Their influence as teachers, authors, composers and performers is acknowledged worldwide. This is especially heard in the harmonic realm where they developed a way of playing that reflected developments in 20th century classical composition alongside a unique approach towards playing the jazz standard repertoire. Most of all, their music, as sophisticated as it may be, is always heartfelt and passionate.